I find myself saying this often, and often in jest, but I think I realize now why I hold a glass of wine so dear. It’s not so much about the wine as it is about me. I realize that when I allow myself to indulge in a glass of wine, I have officially allowed myself permission to relax. When you work from home, and for yourself, there are no breaks. I am constantly thinking of the next photo shoot, the next blog post. I may be running errands, but I am returning emails and visualizing a dish in between. Even on weekends. So when I allow myself to pour a glass, I allow myself to let it all go. I made something for myself yesterday. You know how much I adore figs. As the sole consumer of figs at my house, it is my special treat to myself. And as we head into the late fig season, I have been relishing them with extra gusto, because I know the end is near. 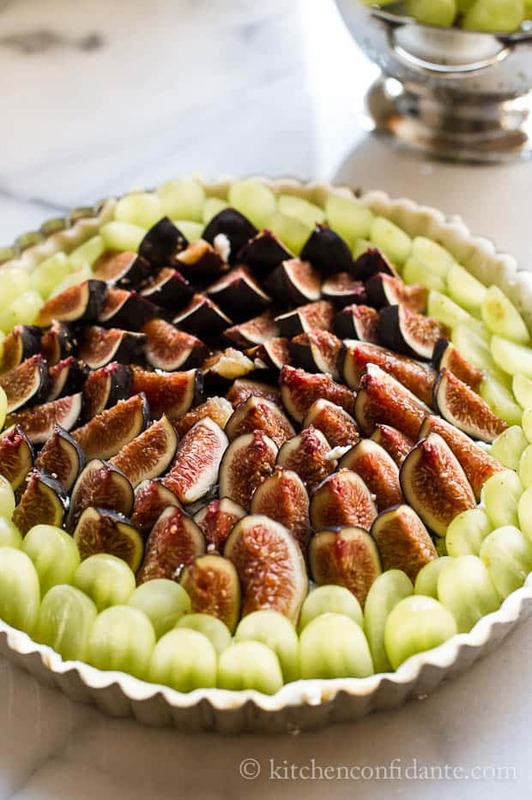 Sliced figs and grapes looked so graceful in my tart pan. Their beauty to me is a celebration of our farewell to summer and entry into fall. 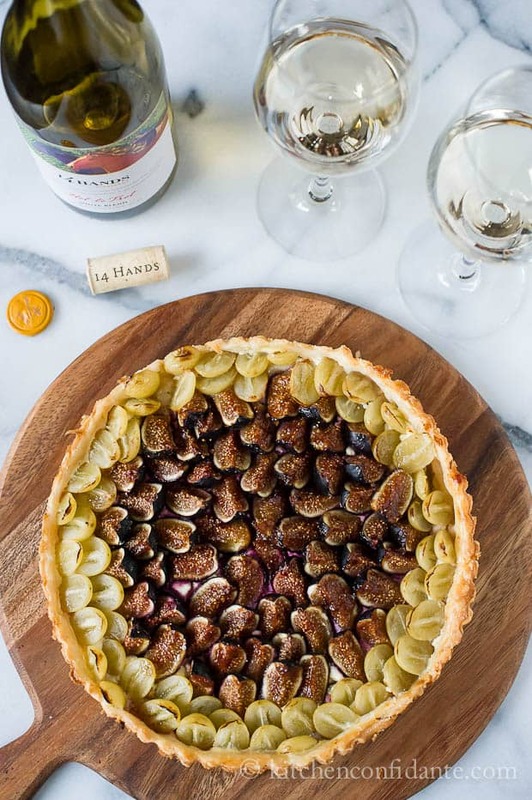 This Savory Fig and Grape Tart would be the perfect treat to go with my glass of wine – this, for me, is the ultimate indulgence. What wine would you drink with this? Well, I do believe a crisp white wine would do nicely. You may even find it in you to share with friends. 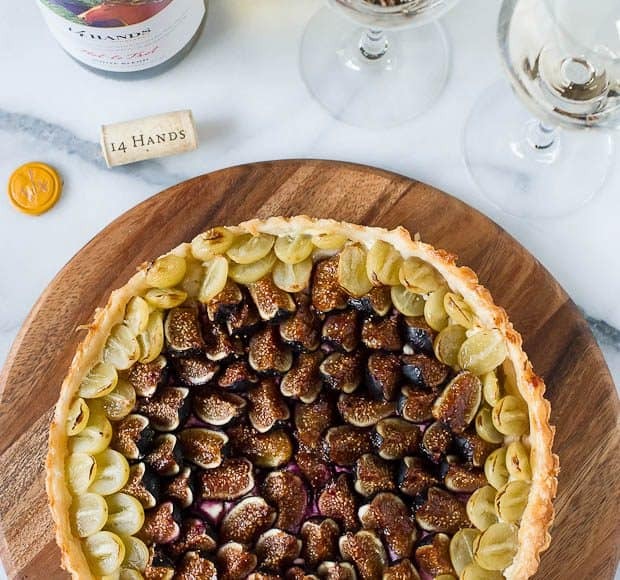 14 Hands Vineyards in Washington invited me to participate in their first recipe program, featuring dishes perfect for the end of summer, to pair with their selection of wines. 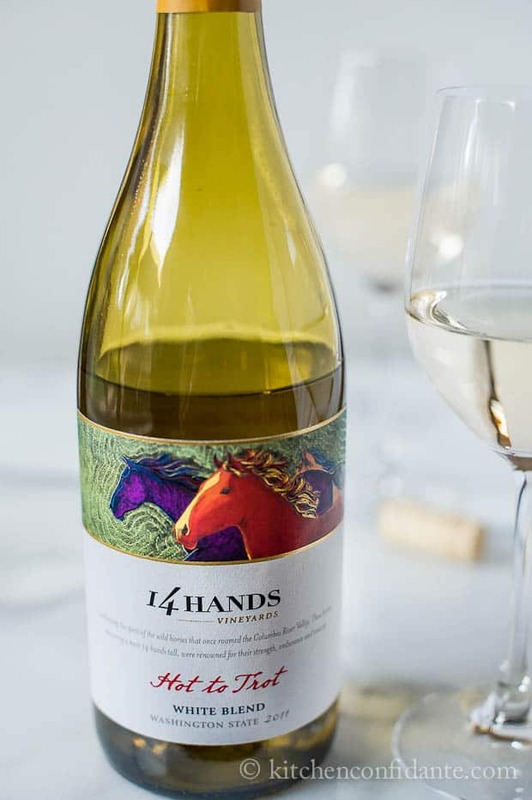 I am slowly getting more acquainted with wines from this part of our country, and was excited to try the wines from 14 Hands. 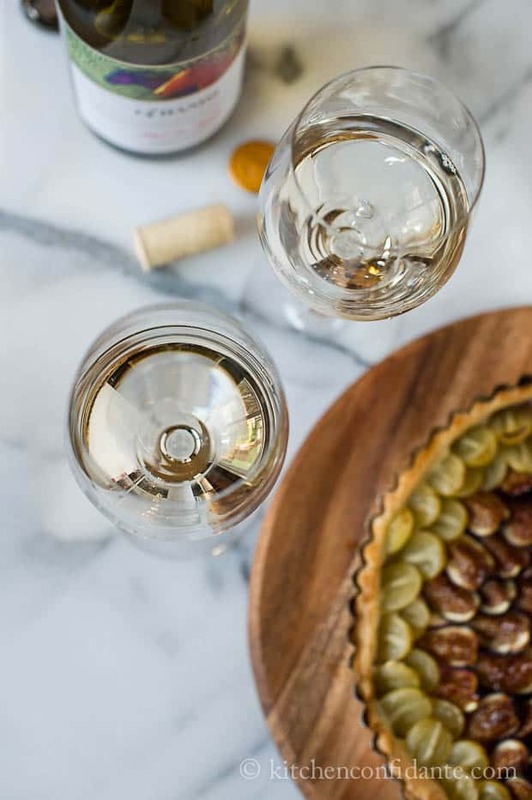 Their white wines went beautifully with this tart. Lovely flavors, the tart picked up on the crisp apples and honeyed tones of the wine. It is something I wish I could indulge in, each and every day. Disclaimer: 14 Hands Vineyards sent me a selection of wines and compensated my expenses in developing a recipe for their recipe program. However, as with all my posts, all opinions remain my own, and I only share products I know you will enjoy. 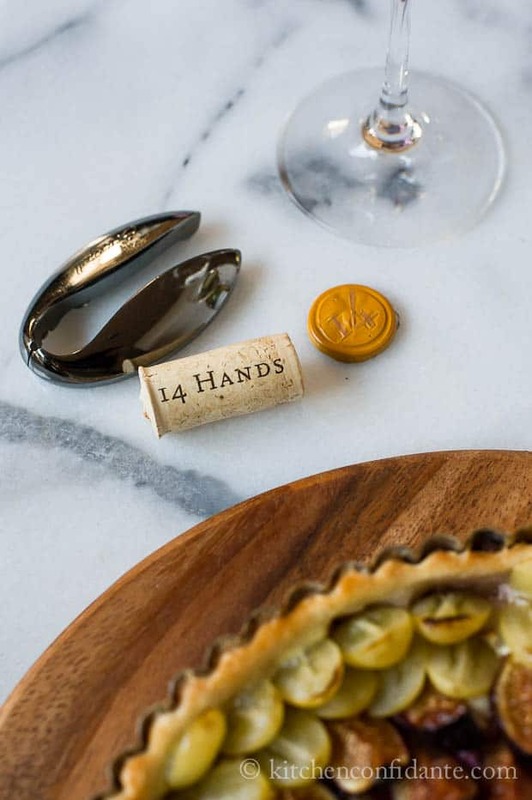 If you were to try just one 14 Hands wine with this tart, I recommend their Chardonnay. It is quite lovely, and at a very nice price, proof that not all wines need be expensive to be delicious. 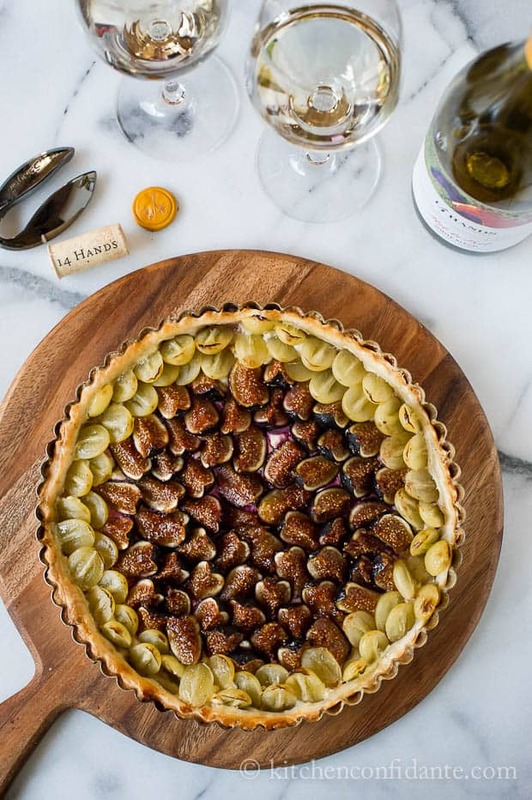 A little bit sweet, a little bit savory, this tart is fabulous with a glass of white wine. It's also great alongside a salad, or nibbled with a thin strip of prosciutto. In other words, it's great party food. 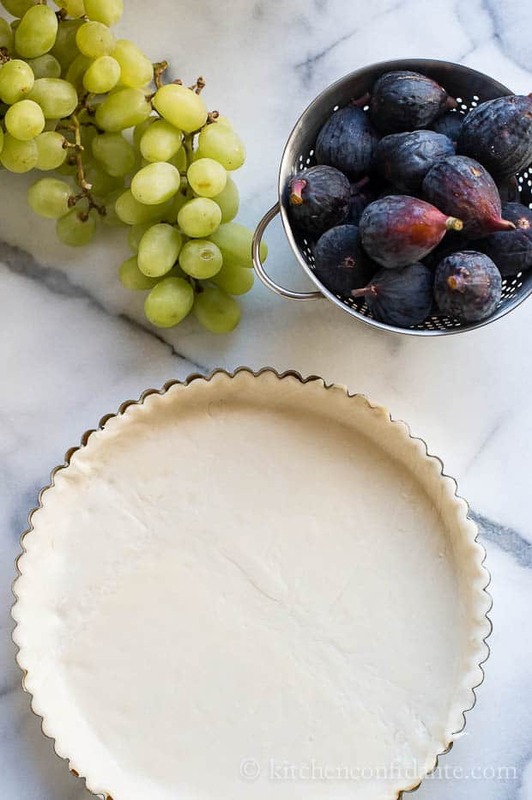 Prepare a tart pan by lightly spraying with cooking spray or greasing with a little butter. If you like, this can be done free form, without a tart pan, and on a parchment lined baking sheet. It can also be made into smaller individual tarts, if you wish. Carefully place the puff pastry into the tart (or on baking sheet), lightly pressing it into the pan, and trim the excess. Spread the goat cheese lightly over the pastry dough. Begin to arrange the figs, starting at the center, moving outwards. Finish off with the grapes around the perimeter. Whisk the egg and lightly brush the edges of the exposed pastry. Place tart on baking sheet and into the oven. Bake for about 30 minutes, or until the puffed pastry is golden brown and fully cooked through. If you see some bubbling, pierce it with a fork and continue to bake. Remove from oven and lightly brush on some warmed balsamic fig jam or honey. When it is cool enough to handle, unmold from the tart pan, slice, and serve while warm. That tart is beautiful! Definitely a perfect bite (okay, several bites) to eat with wine after a long week. Absolutely lovely and will try the wine…..
Liren – what a stunning tart! 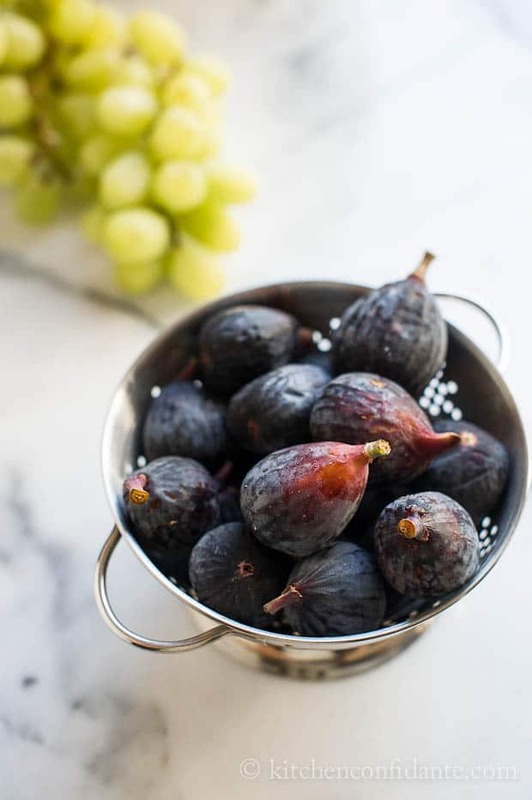 And you know my love obessesion with figs. I bet each bite of this was supreme. The wine sounds great – need to check it out! How lucky to have some sent to you? Smile. Absolutely gorgeous tart Liren. I’m working on my recipe for 14 Hands today…how prophetic I should take a break and come visit your blog! 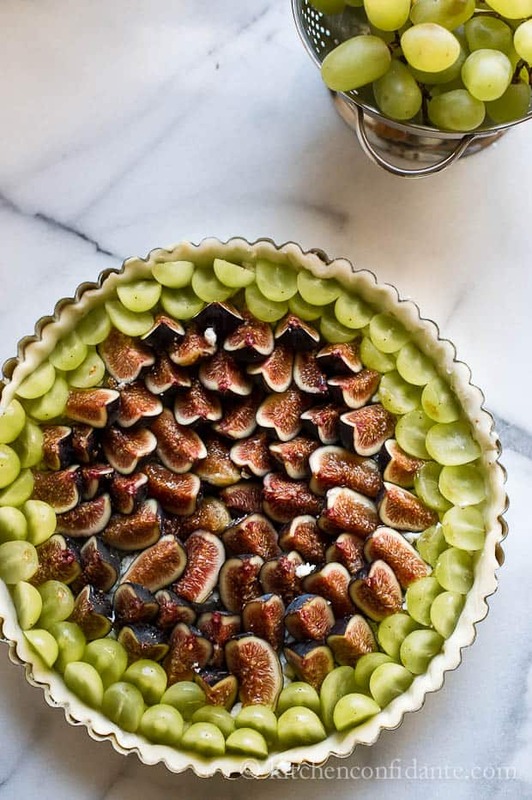 Those little figs look luscious! 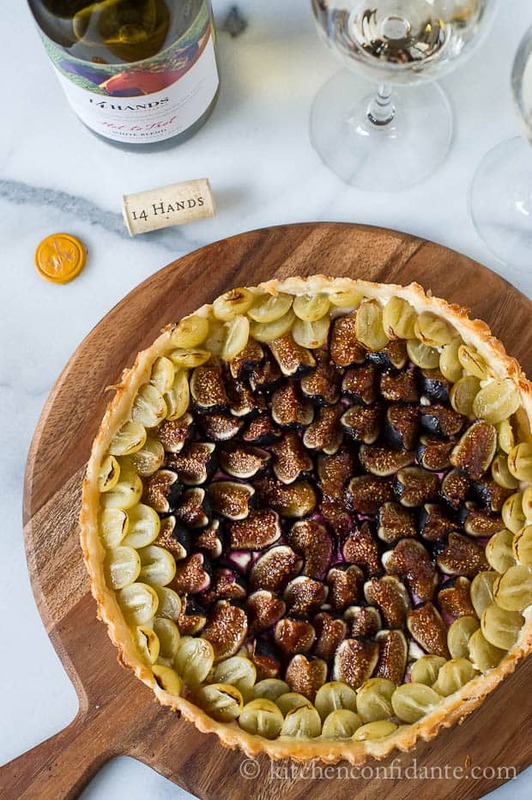 Think I’ll go pour myself a glass of wine and dream about that tart. You’ve given me an idea for a housewarming present. I love the look of this tart. It’s gorgeous. 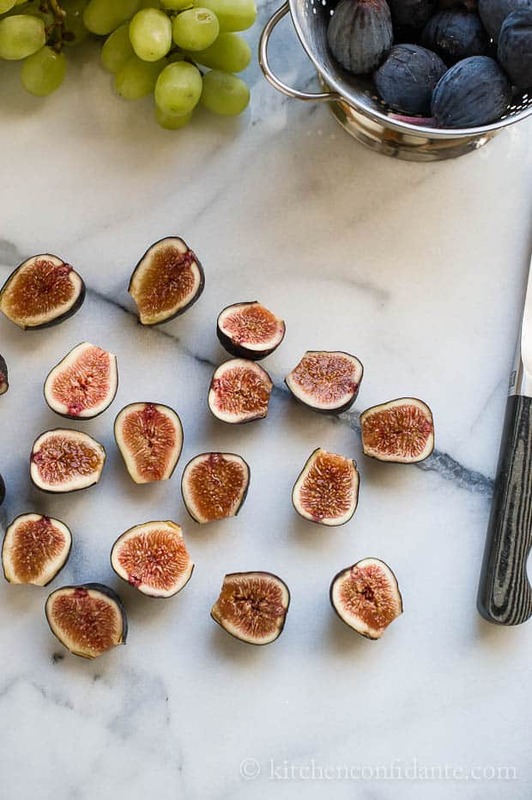 And the figs looks divine. Of course this could only be further improved with a glass of wine. I am speechless. Your photography, presentation and combination of flavors are all outstanding! Thank you so much, Asmita! I am so flattered! The tarte looks so lovely and simple. I’m going to have to get my hands on the last of the figs from this season. Wine o’clock. I’m totally stealing that. 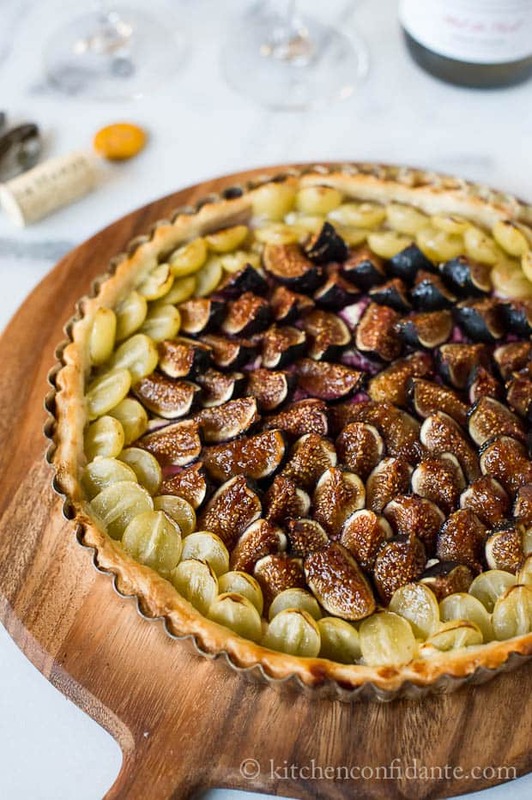 Never thought of savory grape and fig tart – never! What a surprise! Will need to try this soon! Wow, this looks amazing! I was wondering where you got your figs? They look beautiful and I know the grocery stores near me rarely carry such nice ones. Can’t wait to try this! Hi Alice! Thank you :) I get my figs at the local markets, and even at groceries like Trader Joe’s. I hope you find some soon! I would have loved to have seen a sliced piece on a saucer plate. Wonder how that would have happened, but this is an interesting dish.